The Metropolitan Police arrested over 280 anti-fascist activists, local community members, and passersby in East London on 7 September, as up to 700 English Defence League supporters were allowed to march over Tower Bridge and rally at Aldgate without encountering any mass opposition. A large community demonstration was restricted to Altab Ali Park, well out of sight of the EDL’s march route and rally point. A bloc of around 600 within the demonstration, coordinated by the Anti-Fascist Network (AFN), attempted to hold a march to get within sight of the EDL’s route and present a visible opposition, which was then blocked and kettled by police. Despite police attacks the front of the AFN bloc did manage to get within sight of the EDL march, meaning the only political opposition the racists saw on the day was a direct result of the AFN mobilisation. Anti-fascists, independent legal observers, and people who were just passing by were detained on the street for over six hours before the police announced their intention to make mass arrests. Arrestees were taken to police stations on the outer extremities of London — including Colindale, Sutton, and elsewhere — mostly under the pretext that they had committed an offence under the Public Order Act. Their alleged ‘crime’ was to march down a street the police didn’t want them to march down. Some arrestees were held for up to 15 hours in total. Were it not for the work of arrestee support groups, many of those detained would have been thrown out of police stations in the middle of the night on the outskirts of London with little way of getting home. Most have now been released with highly restrictive bail conditions preventing them from opposing the EDL and other racist groups. “Carrying out mass arrests on any demonstration is an excessive and draconian measure. In this case it was clearly not necessary to prevent disorder – many, if not most of the arrests were carried out after the EDL had left the area. 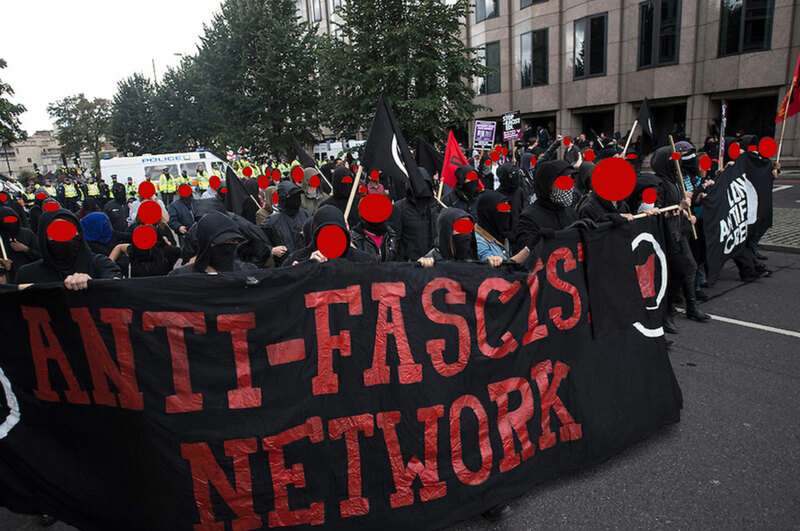 – The Anti-Fascist Network is a network of independent anti-fascists and anti-racist groups from across Britain, fighting the far right on the basis of direct action and working-class politics. Posted on September 15, 2013, in Europe and tagged Antifascism, UK. Bookmark the permalink. Leave a comment.